Home > Bathroom Scales > HEALTH O METER, DIAL BATHROOM SCALE, 142KD-41. Your measure for good health. Health O Meter, 142KD-41, BIG FOOT, Speedo! The Doctor's Scale, Extra Large Dial Personal Floor Scale. With EXTRA LARGE numbers, and a LARGE very easy to see Dial. Accurate up to 300 pounds. 11 3/4" Wide, yet sleek, updated platform design. Includes sturdy rubberized feet, to avoid sliding of scale. Also INCLUDES Textured Surface to Stand on, to Help Avoid Slipping. This high quality Extra Large Big Foot, dial bathroom scale, would be a wonderful addition to any bathroom decor. It has detailed styling accents for the new types of bathroom decor. This is a fine floor scale that would work well, and give you years of trouble free service. 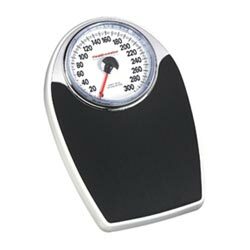 We consider this newly styled Big Foot, large dial bathroom scale another best on line buy, here at AAWSales.com.